God has blessed us with so much, one way we can express our thanks to God is by volunteering an hour or two of our time each week to our church community. 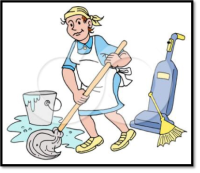 We are looking for volunteers to help us clean the church on Monday mornings after we pray the Divine Mercy Chaplet and the Marian Prayer for Priests. If you are interested in helping us in any way please call. Remember the saying, “Many hands make light work,” come join us.